The City of Angels i.e. Bangkok, is a city you might not want to permanently reside in, but it is certainly a city well worth a visit or two. Imagine a very large town, halved by a river, without a planned street grid where even today, after a number of boulevards and elevated highways have been built since my last visit, the traffic is still so brutal that, when asking for directions, the locals will say “twenty minutes to two hours, depending on the traffic”. Driving in Bangkok requires nerves of steel as traffic regulations are more often ignored than observed, and hiring a car with driver or using a taxi or even a tuk-tuk -- colorful, much cheaper but not particularly safe -- is highly recommended. It is said that Bangkok has three seasons: hot, hotter and hottest and almost always extremely humid; travelers not used to tropical heat and humidity find the need to shower two or three times a day. Having said all that, I love Bangkok because it was my first exposure to a culture that was completely different than mine, over 30 years ago. Bangkok, being Thailand’s capital has everything; from super luxury 5 star hotels (27 as of last count, representing every international luxury hospitality group plus a number of Thai luxury hotel companies) to open-air floating markets (Khlong Lat Mayom); from high-end fashion malls with international luxury merchandise to used engine-part shops in Chinatown; from palaces to earthen-floor houses. The Thai people I met are all, without exception, very friendly, patient and tolerant. They greet you with a “wai”� a small bow, pressing the palms together at chin level in a prayer-like gesture. Everyone smiles, because it is considered very bad form not to. Bangkok’s residents are also considerably artistic. 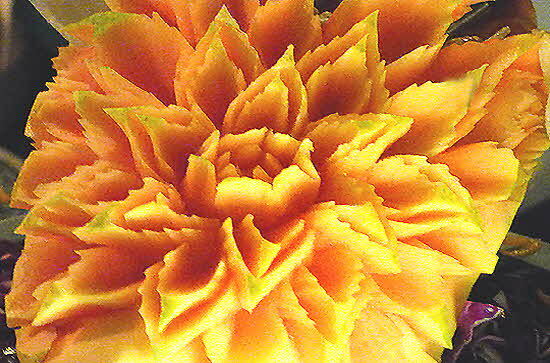 In addition to local performances of classic Thai dances that take place during holidays, you will find that most of the better restaurants employ “fruit carvers” an ephemeral art form that takes large fruit -- melons, watermelons and even smaller like papaya -- and carves them to create images of exotic flowers or animals. 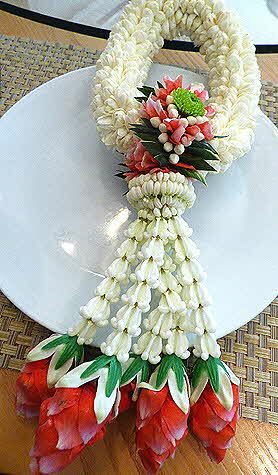 I did not see as much fruit carving further South, but it was practically ubiquitous in Bangkok! Another lovely art form that is sometimes given to honored guests at some of the top hotels are the "Phuang Malai" flower garlands with which they welcome you on arrival. They are also presented as temple-offerings and are kept for good luck. Mine was made from hundreds of jasmine buds plus five red colored buds and the jasmine aroma permeated my room as I kept it by my bedside. Images of a very ancient culture are still surviving in and around Bangkok. 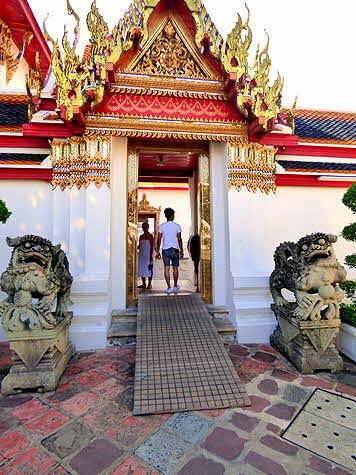 The magnificence of the Grand Palace and Wat Phra Kaeo -- the Temple of the Emerald Buddha -- offers to visitors a panorama of Thailand’s last 300 years of history. Entering through the Gate of Wonderful Victory one sees at the end of the street leading through the outer courtyard, the Great Maha Chakri Palace, the center point of the Chakri Complex. It is the only structure in the compound built to a European prototype as an Italian Renaissance building, but with a typical stepped Siamese roof. The palace was occupied by the king and queens of Siam, as the country was known prior to 1940. The king occupied the east wing, the queens the west. In this building the Audience Chamber with the silver throne under a nine-tiered umbrella is sometimes still used on special occasions, especially when the king receives ambassadors. Most of the buildings, gables, courtyards and entrances, are gilded and richly decorated with murals, and brightly hued carvings, statues of mythical creatures and gilded Buddahs, pillars with lotus capitals and glazed earthenware tiles. 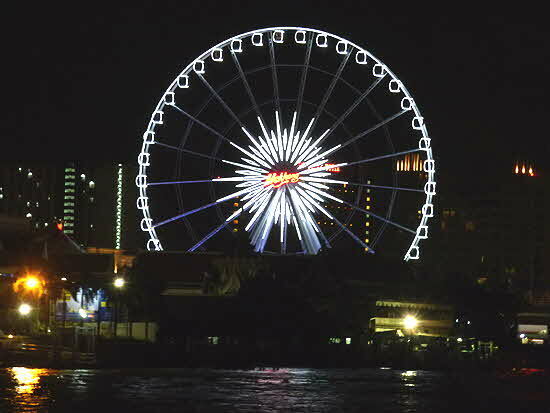 If you are staying at one of the river-front hotels, use one of their boats to cross the river or to go to one of the riverside malls that is close to your destination, then take a taxi or walk from there. 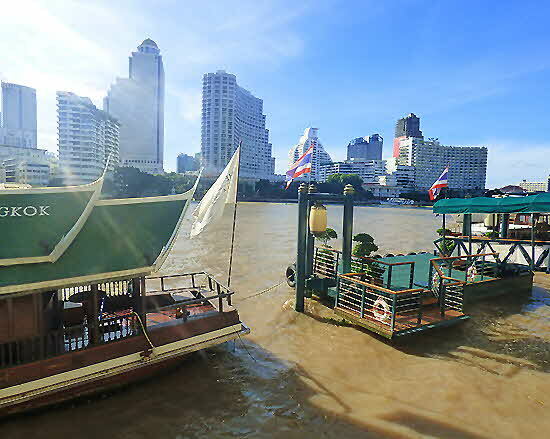 Many, like the Peninsula and the Mandarin Oriental, have boats that will take you to planned stops along the Chao Phraya and also much larger river boats that will take you as part of an escorted trip as far as Ayutthaya, the old capital of Siam from 1350 to 1757. Bangkok’s latest population explosion started in 1993/1994 with the beginning of the arrival of affluent Occidental and Chinese businessmen and their families fleeing Hong Kong, as the transfer of sovereignty over Hong Kong known internationally as "the Handover" from the United Kingdom to China was to take place on 1 July 1997. To accommodate these new arrivals, the international luxury hotel industry started building numerous 5-star properties in the early 1990s throughout the city, but mostly by the riverside where the Peninsula, the Shangri-La, the Millennium Hilton, the Chatrium Hotel Riverside Bangkok, the Royal Orchid Sheraton and others are now located. One of the newest hotel properties is the 137 Pillars Suites and Residences, a luxury property on a centrally located 30-floor tower that is associated with the 137 Pillars House, a historic building in Chiang Mai that belongs to the same owners. I stayed there on my return from Phuket (see 137 Pillars article). Additionally, one of the oldest luxury hotels in Asia is the Oriental (nowadays The Mandarin Oriental); the 2-story original colonial building was erected in 1876. It is a timeless deluxe property, in the middle of a lush garden on the bank of the Chao Phraya, where the ratio of staff to guests is still 2 staff for every single guest! It is famous for the Author’s Suites in the original hotel; these suites are a tribute to some of the great literary figures that have stayed in the hotel over the years. The modern main building is a multi-story tower, next to the old hotel, that has rooms and suites and exceptionally beautiful public areas. The Peninsula Bangkok is the 5-star hotel I spent 4 days during my recent visit to Bangkok and is located right across the river from The Oriental. It is part of the Peninsula Hotels Group; the original Peninsula on Salisbury Road, Kowloon-side, Hong Kong, opened its doors in 1928 and is a storied grand dame hotel. 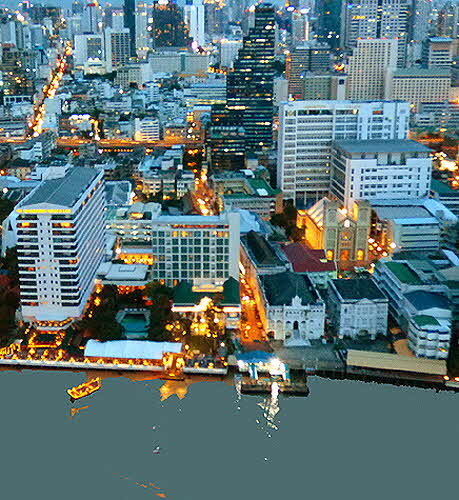 The Bangkok Peninsula opened its doors in 1998. It is a 37-floor high rise that offers 370 rooms and suites. It has magnificent public spaces on the first floor and an atrium that reminds a bit of the original Peninsula’s lobby in Tsim Sha Tsui, famous for its afternoon tea and intricate cocktails. 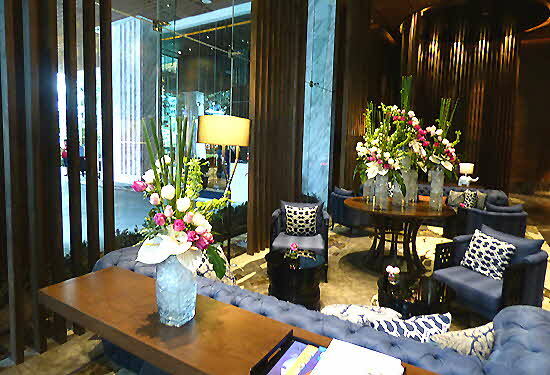 One can have cocktails and afternoon tea at the Bangkok atrium as well. 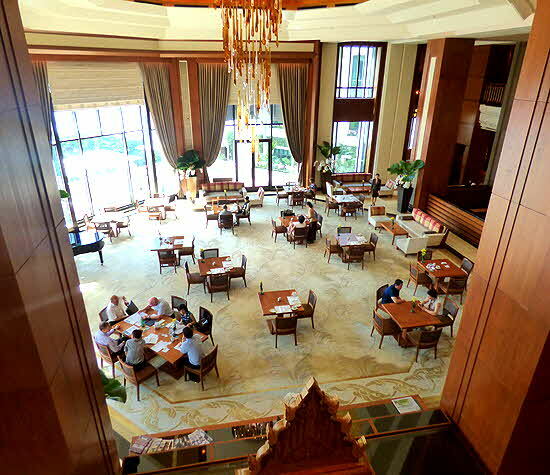 The restaurants that offer breakfast and exceptional Oriental and Occidental dishes are located at the garden-level of the South Wing, overlooking the landing pad of the Peninsula’s river boats.